My girls have been asking to learn Spanish and we had a fun opportunity to review a program called Spanish For You!, which includes audio of a native Spanish speaker reading the lessons. They have truly enjoyed it! 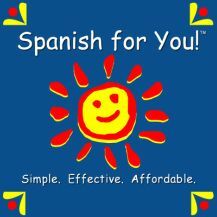 Spanish For You offers two programs, Estaciones and Fiestas. A third program, Viajes, will be available in June. We opted to study Estaciones. I'd like to say that my old Spanish lessons came flooding back to me, but sadly, no. I learned right alongside the girls. The lessons include plenty of vocabulary, but students are gently and quickly introduced to conjugating verbs, learning the Spanish alphabet, and writing in Spanish. The program is designed to be taught 4 days per week for 24 weeks, but is easily adapted to any schedule. We prefer to do about 20 minutes each day. All of the programs available are for grades 3rd through 8th. There are 3 different grade levels in each package and they can all be taught to students together, so that the whole family can learn together. Each program helps students develop fluency and can be completed in any order, as each simply adds to the student's vocabulary and reinforces the grammar concepts taught in each book. My girls opted to draw their own flashcards on index cards and they have really enjoyed quizzing each other on their new words. I love that I can include multiple age groups together for lessons. I love that they aren't spending years building a vocabulary and then slowly learning to put it together. It is a much more natural method. 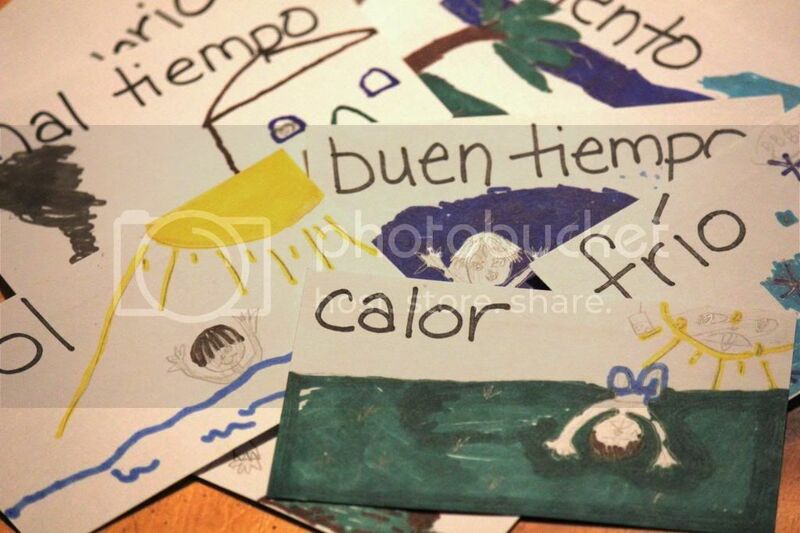 Within weeks, they are forming sentences about the weather and about activities, such as drawing a picture of the weather. I love that I didn't have to speak a lick of Spanish to teach it. I was able to learn with them. I love that my girls have a lot of fun learning with it. I love that the audio with a native accent helping me not butcher the pronunciation. more time between phrases in the audio. The last one wasn't really a problem since I was able to just hit pause as we followed along. And if it were slower, someone else could just as easily complain that they wanted it faster. Also, the page numbers imply the lessons need done in a certain order, but really, you can follow your students interests with this program and jump into the book wherever you want. The program takes 24-30 weeks to complete, unless you are slow like me. We like to stretch things out a bit. You can purchase grade levels packages (3-4, 5-6, 7-8) for $39.95 each, or you can purchase a package that includes lesson plans for all grades for $64.95. For a classroom setting, an optional teacher lesson book is available for $12.95. I did not review this optional book, but I can definitely see this program being ideal for a co-op setting since it covers multiple age groups so well. There are also many games that Debbie shares for free for anyone interested. Be sure to see what other Crew Members think of this great Spanish Curriculum!